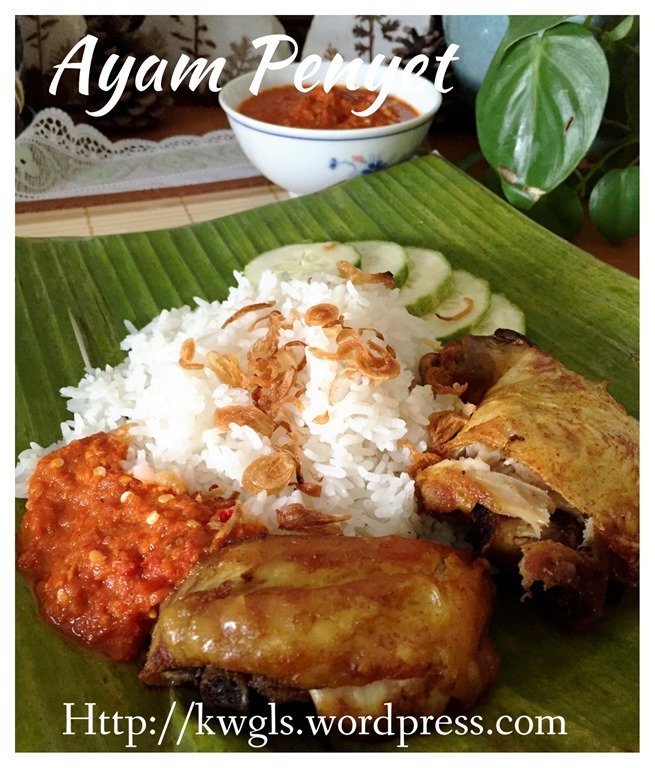 Ayam means chicken and penyet means smashed – the chicken was usually cooked, smashed and seasons with herbs and spices. 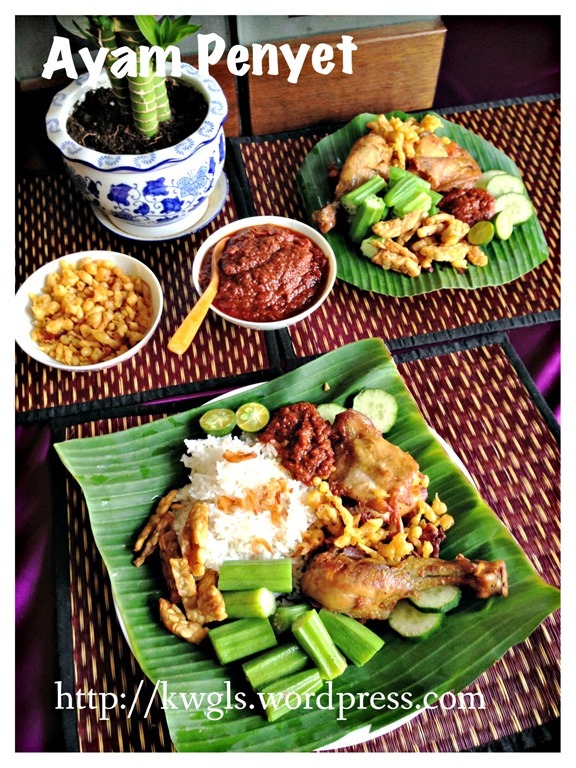 It was then served with special spicy sambal or chilli sauce and some special fritters called kremes. 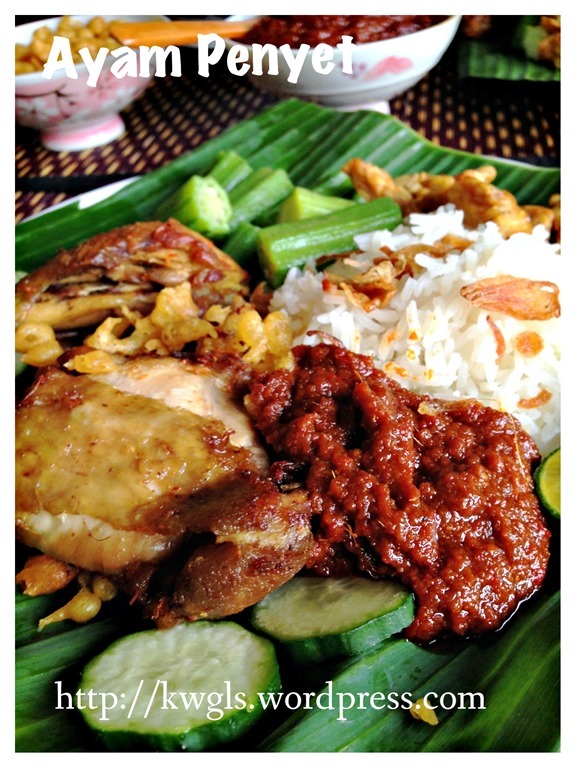 It is a popular chicken dish that was sold in restaurants and hawkers centre. 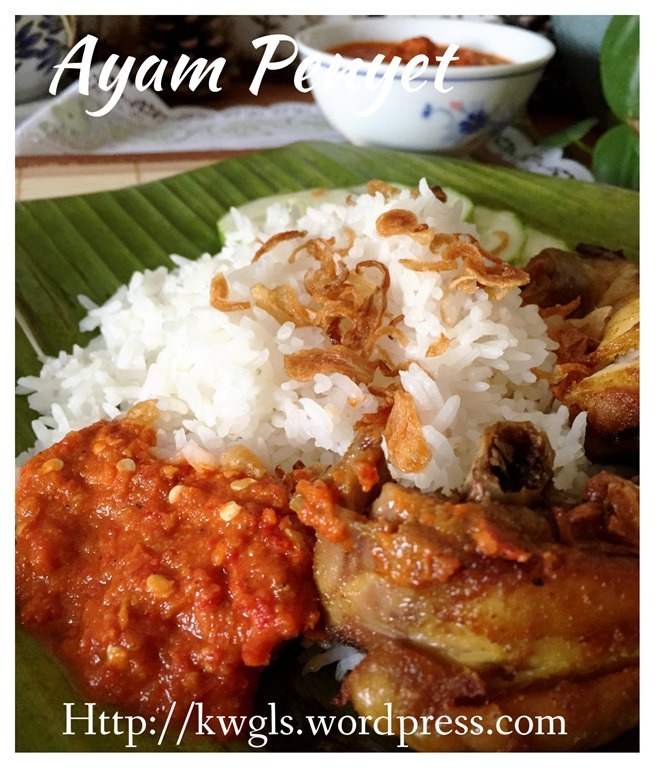 I have my fair share of ayam penyet during my business stays in Jakarta, Indonesia years ago. I am sharing a rather unconventional method of cooking, using the microwave to pre-cook the chicken, marinate and deep frying instead of boiling the chicken over the stove before it was deep fried. If you do not have the microwave oven, you can just boiled the chicken using some water over the stove. I have used a mixture of traditional mortar and pastel and modern blender depending on what is more convenience to me. Therefore, these two are substitutable. 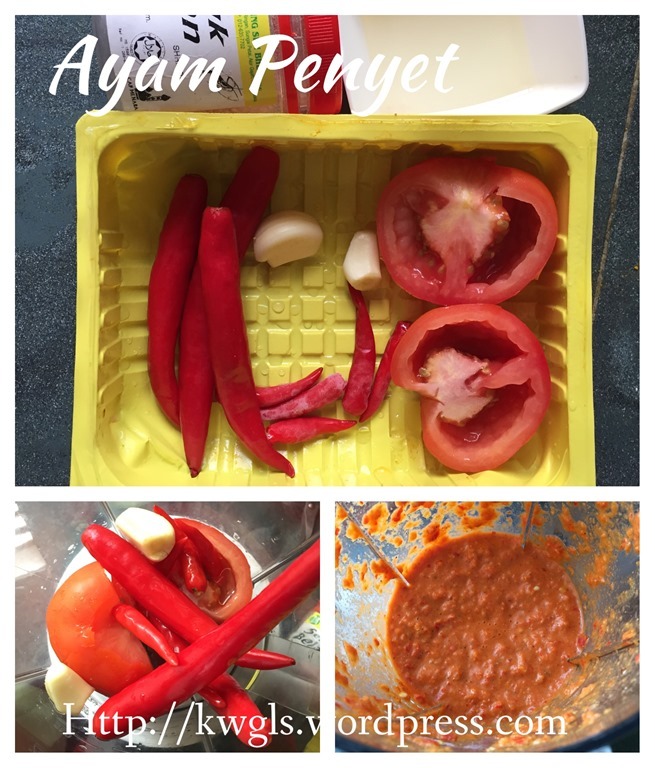 Using blender will yield a finer chilli sambal and that may look slightly different from the sambal that you are eating in the stalls. 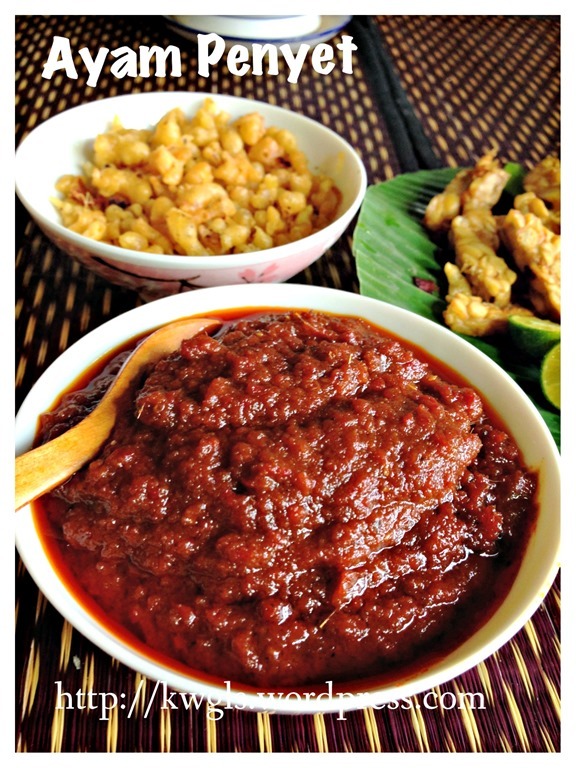 Those sambal usually comes with chilli seeds and tomato seeds as they are using a mortar and pastel to pound. 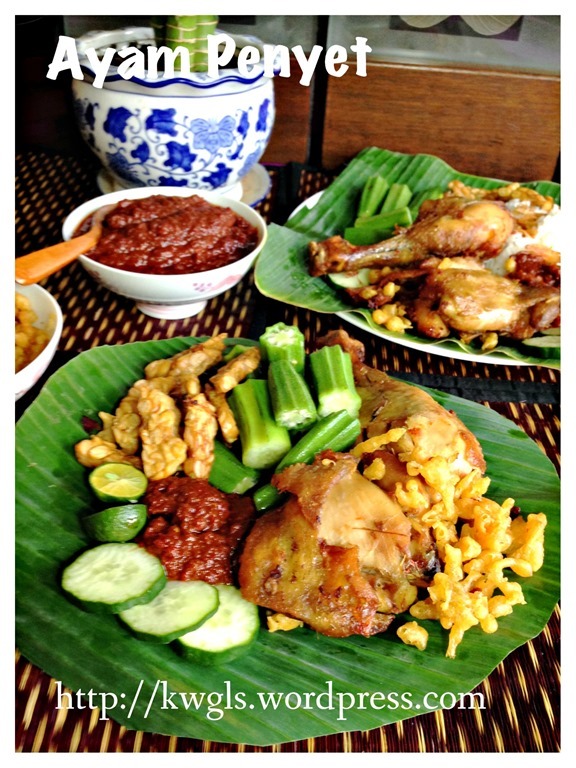 The sambal and marinating recipe are very versatile. Most are optional ingredients and substitutable, therefore, feel free to add or minus the quantities or ingredients stated to suit your taste buds. 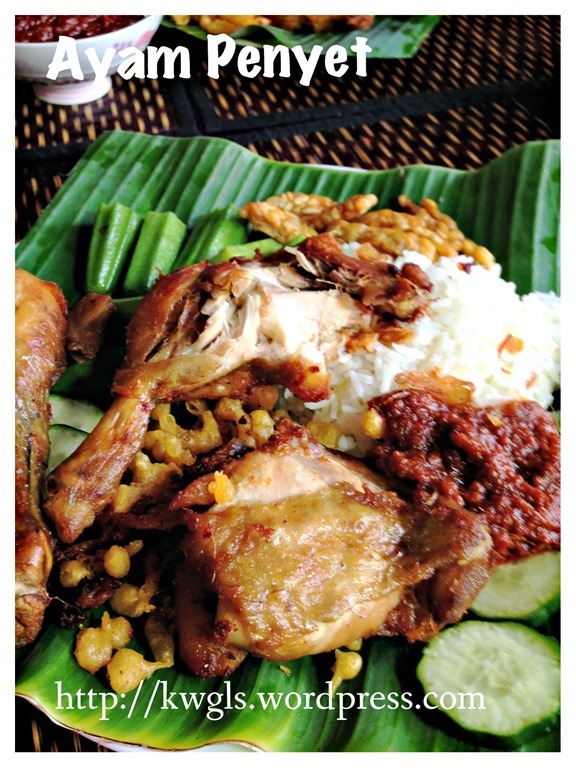 It can also used for nasi lemak as well though the ingredients are slightly different. 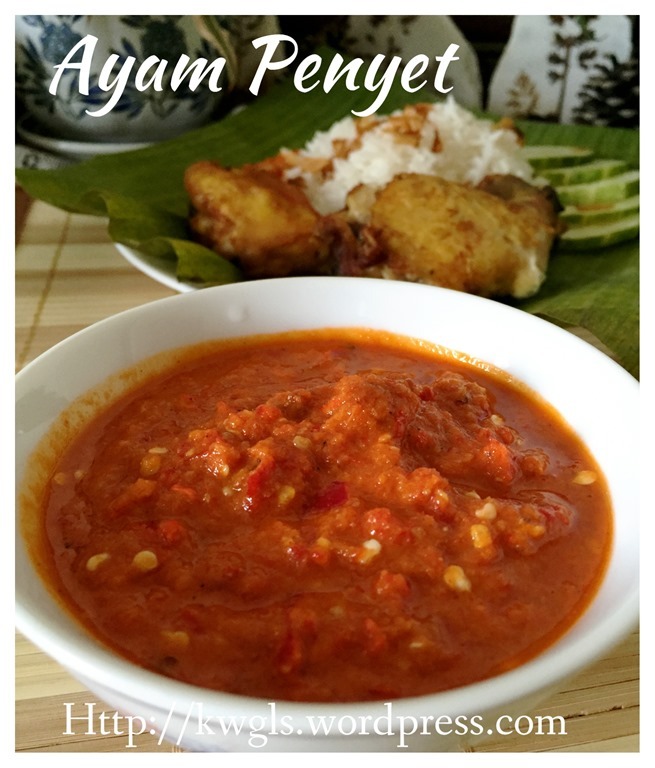 However, as far as sambal is concerned, one can hardly find two exactly similar recipe and as the saying goes, the number of sambal recipe can be as many as the number of grandmothers in a village.. Meaning, every household will have their own recipe that they are proud of. Whether smashing the chicken is before serving or before the deep frying is up to you. If you want more juicy chicken, you can pound before serving. As I prefer the chicken to be a bit crispy and chewy and full of herbs flavour, I have smashed the cooked chicken before marinating and deep frying. 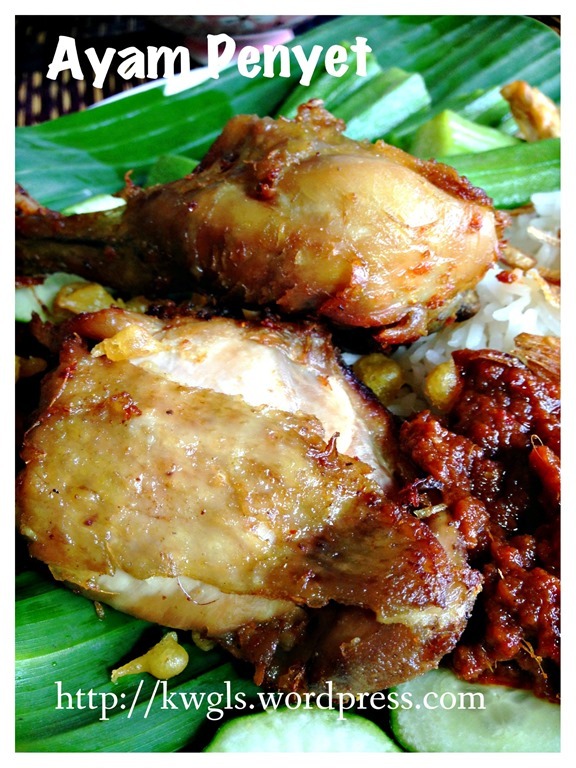 Most of the chicken that I have tasted are not actually juicy, but more of crispy, a bit chewy and rather dry. Having said that, it is full of herbal aroma. 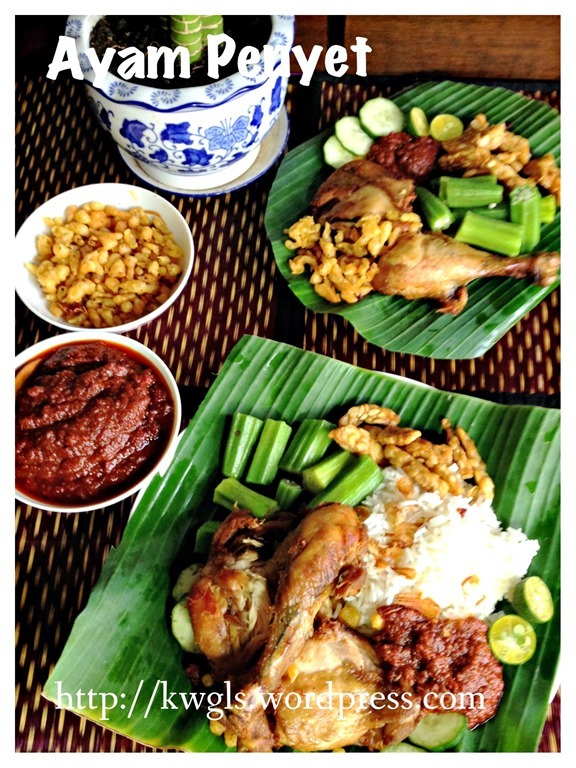 In fact, some recipes requires very lean chicken such as ayam kampong (chicken bred in a courtyard). Depending on what is your preference, if you want juicier chicken, deep fry for a shorter period of time and for this illustration, I have purposely deep fried until it resembles the one that I have eaten in Jakarta. If you do not want to deep fry, you can always try to air fry the cooked chicken. As for the special fritters or kremes, depending on the size of the sift you have, smaller holes will yield much smaller fritter and the fritter in this illustration is slightly bigger than what is commercially sold because i have made a wrong decision of using a sift with bigger holes. 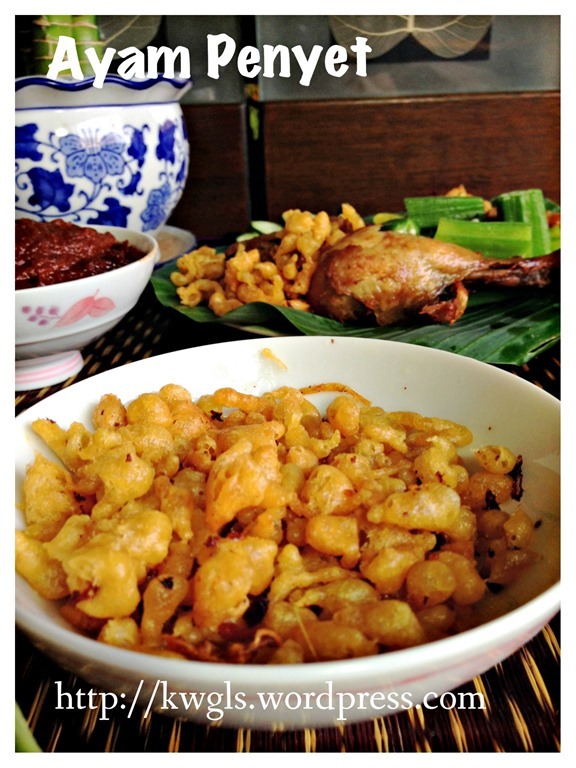 However, such fritters are optional and if prepared, it definitely goes well with the fried chicken. Some vegetables such as ladies fingers, cucumber, kangkong or others and side ingredients like taukwa or tempeh to go with the chicken dish. Cooked the chicken (to about 80 per cent cooked) in the microwave in accordance to microwave instructions. If you do not have a microwave oven, cooked the chicken in a hot pot of water (water adequate to cover the chicken), cooked under high heat for about 10-15 minutes or until the chicken is 80% cooked. 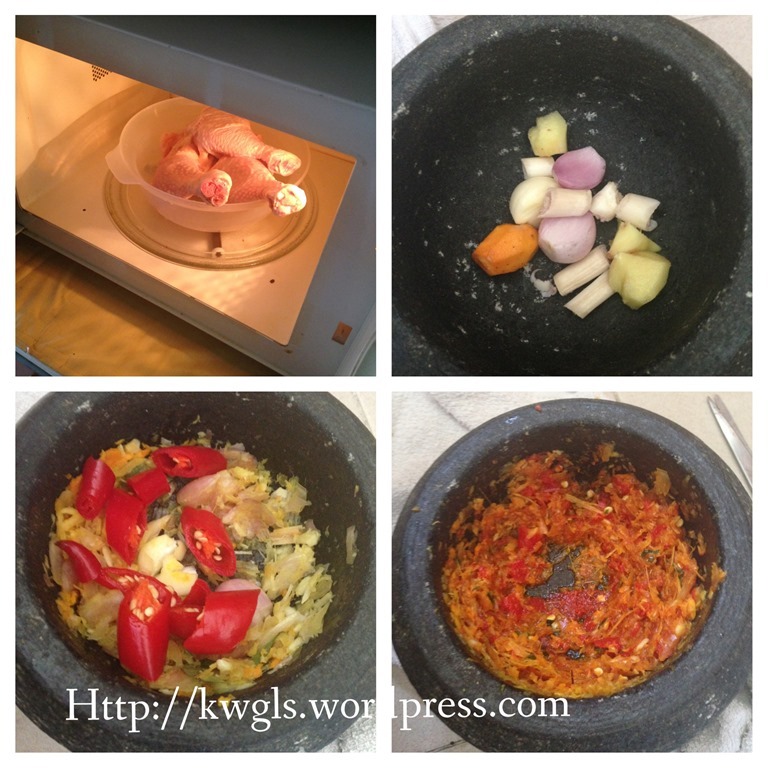 Meanwhile, blend the chicken marinating ingredients in a food processor or pound in a mortar until fine. Set aside for later use. When the chicken is ready, use something hard to slightly smash the cooked chicken (optional, you can smash it before serving if you wish). Spread the chicken marinating ingredients over the chicken thoroughly. Marinate for at least one hour. 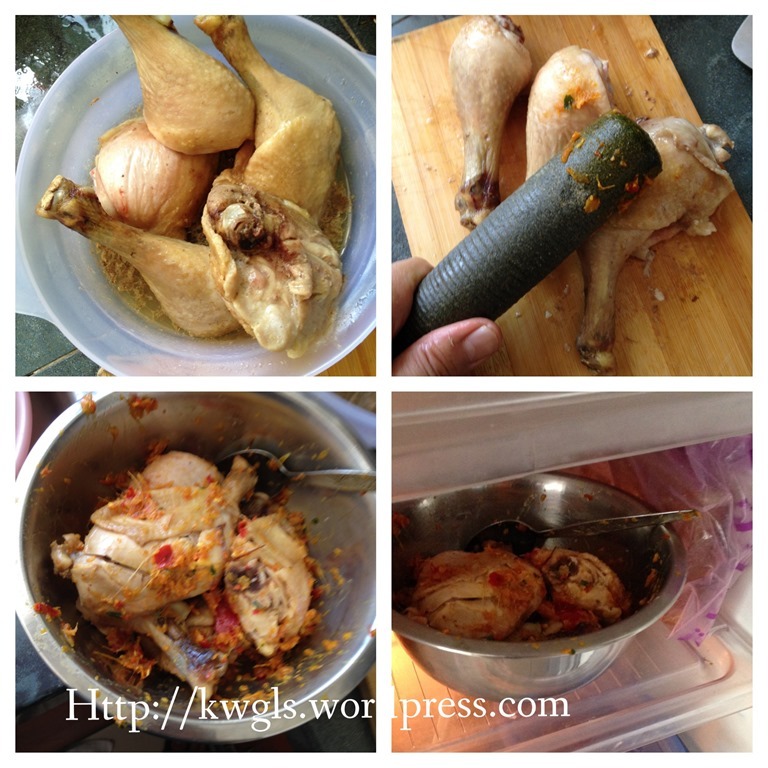 Keep all the meat juices or chicken stocks from cooking the chicken. After marinating, set aside the chicken for later deep frying. 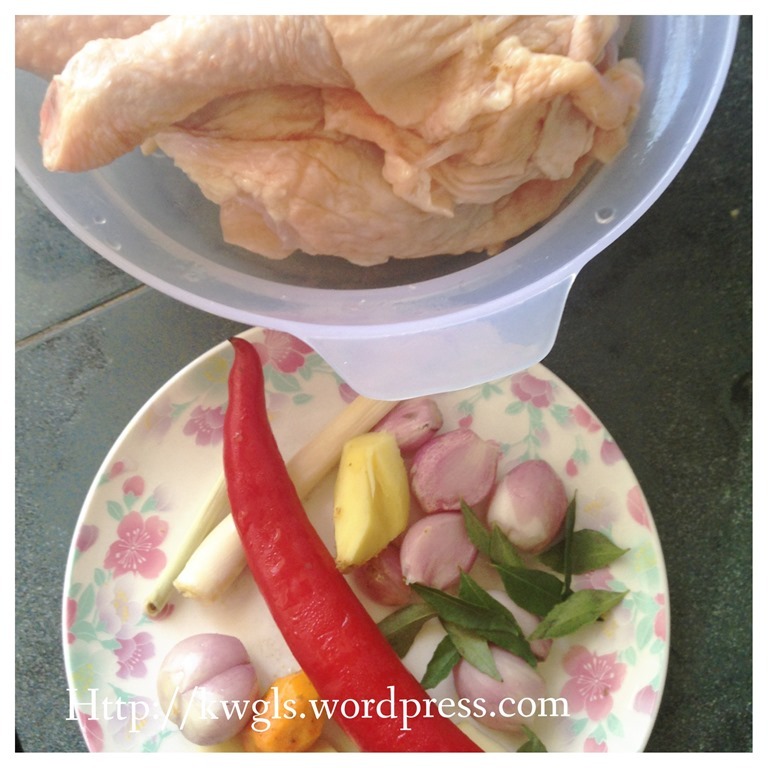 Add some chicken juices to the chicken marinating herbs. Strain and add some (1-2 tablespoons) self raising flour , stir until well mixed. Set aside for later use. Heat up a pot of hot oil, deep fry the chicken until golden brown. If you prefer crispy chewy chicken, you will need to deep fry longer. Drain the chicken and pour the batter in a. Sift the batter into the hot oil and deep fried the fritters for 2-3 minutes or until golden brown. Note that this sieve’s holes are slightly bigger. Therefore, you may want to use a sieve with smaller holes. 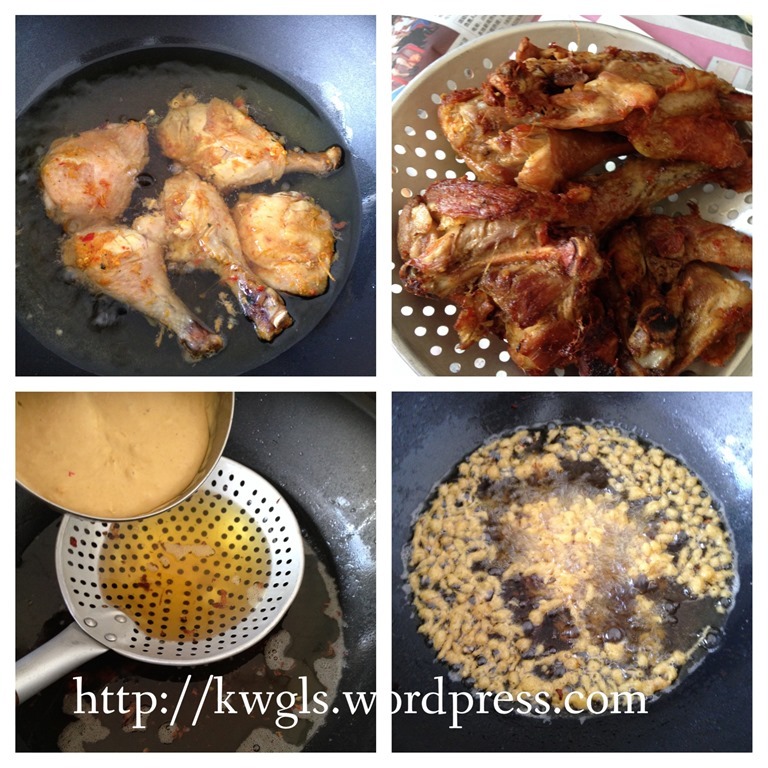 Drain the chicken and kremes or fritters in an oil absorbing paper. 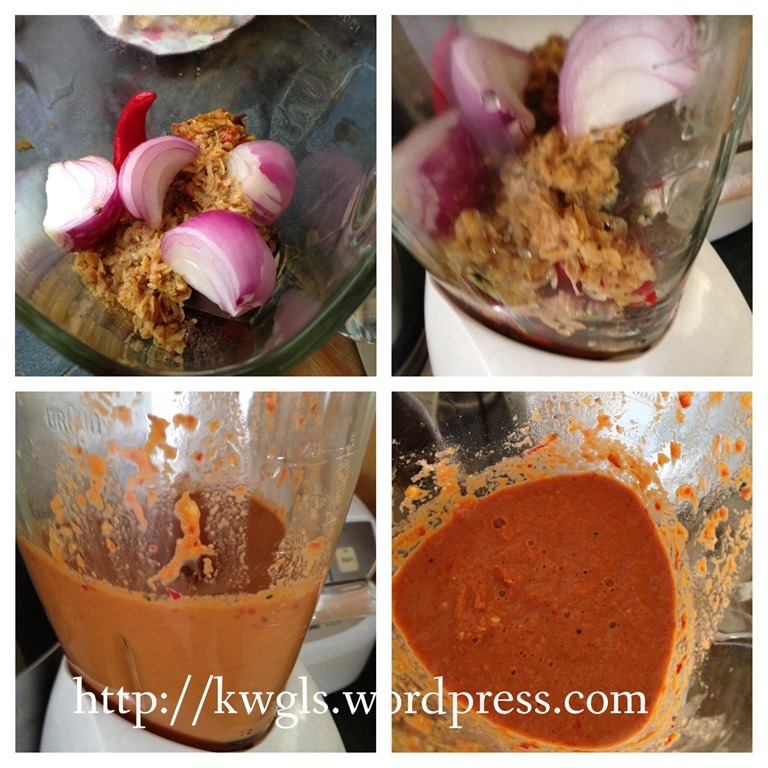 To prepare the sambal or chilli dip, put all the ingredients in the blender and blend until fine. 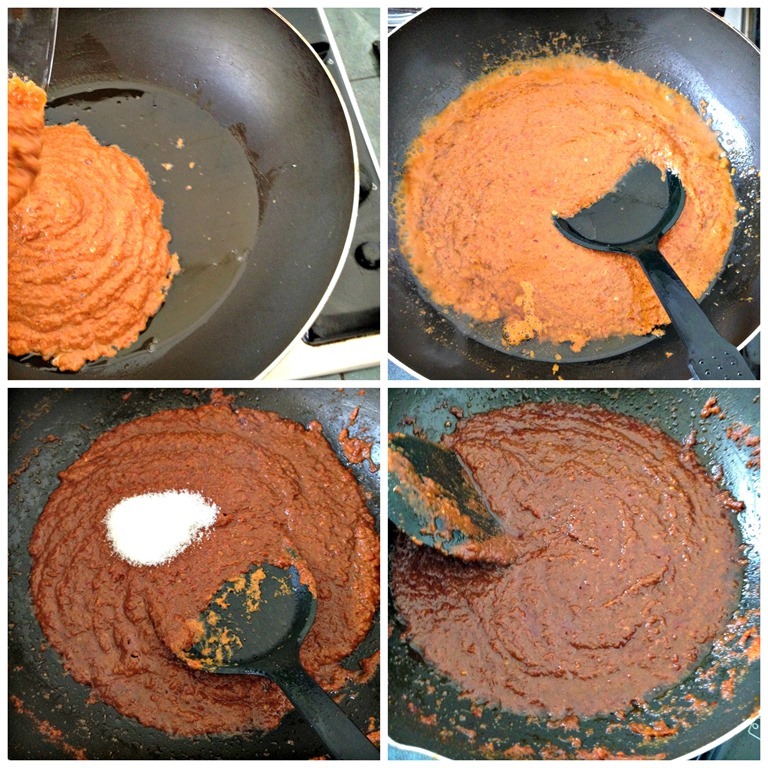 Have a few tablespoons of cooking oil, cooked the blended herbs until the colour darkens, the sambal thickens and fragrances penetrates the house. Before off the heat, add the sugar and lime juice, stir until well mixed. Dish up and served with the chicken. 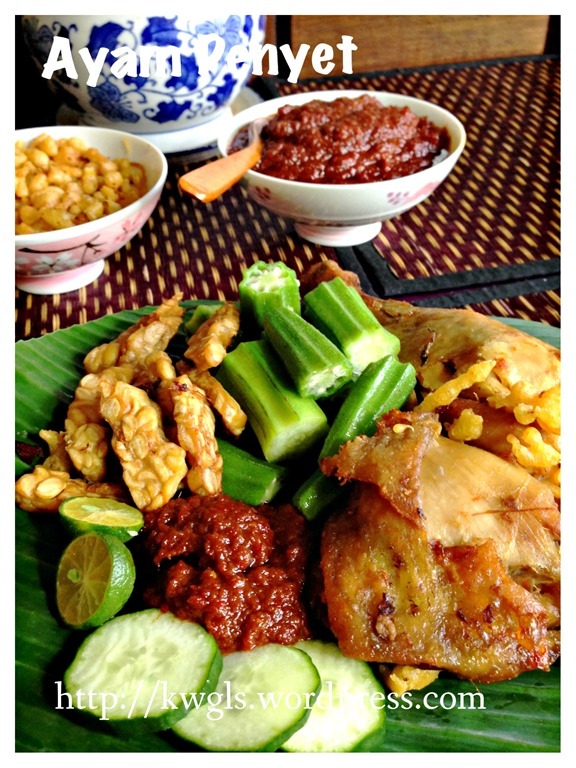 Before serving, smashed the fried chicken (if desired) and the dish is best serve with additional lime, some blanched ladies fingers, fresh cucumbers, fried tempeh, taukwa or any other ingredients that suit your taste buds. 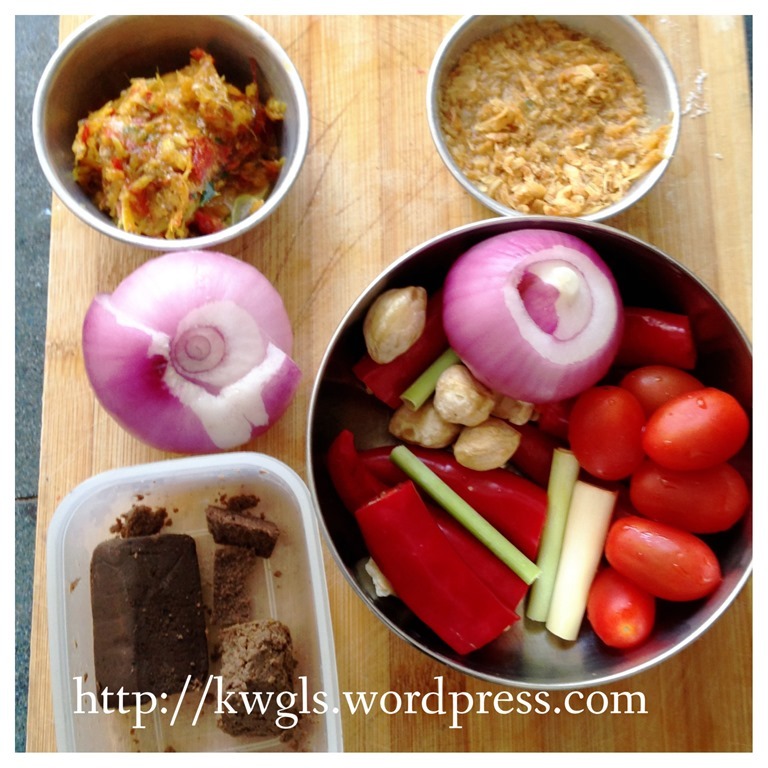 A rather long post and I hope that this post will serve as a starting point for you to cook the dish. Based on this, you can then adjust it to suit your taste buds in the next try. You can also join the FOOD BLOGGERS AND FOODIES UNITED FACEBOOK GROUP to see more recipes. Currently there are about 11,000 members sharing various food photos . I am posting my daily home cooked food in the above Facebook Group daily. I would be more than happy if you can post in the Group for the recipes that you tried from my blog. 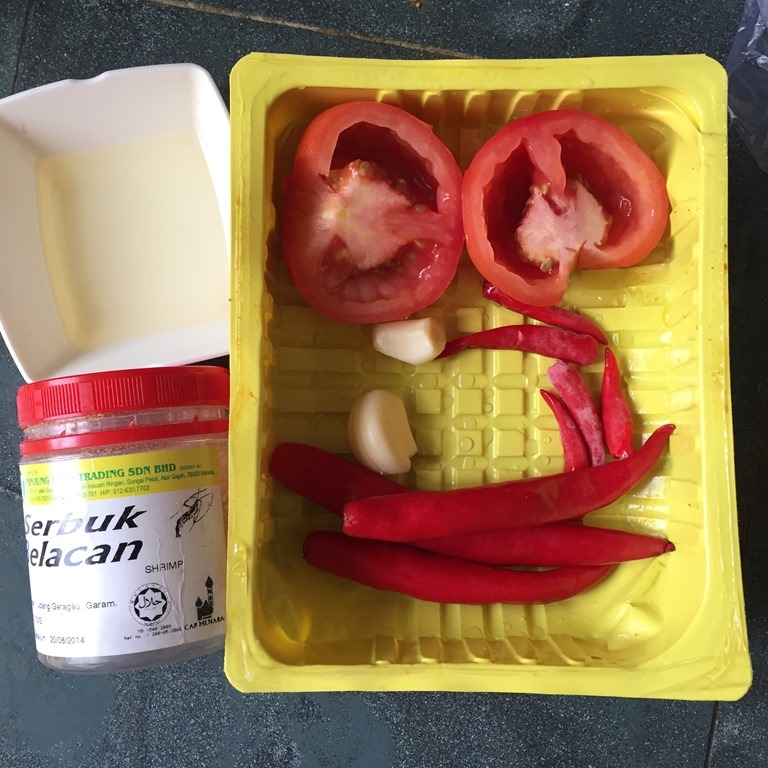 This entry was posted in Dish, Food Preparation Series, Meat Dishes and tagged 8, GUAI SHU SHU, Guaishushu, kenneth goh, kremes, postaday, 印尼炸鸡. 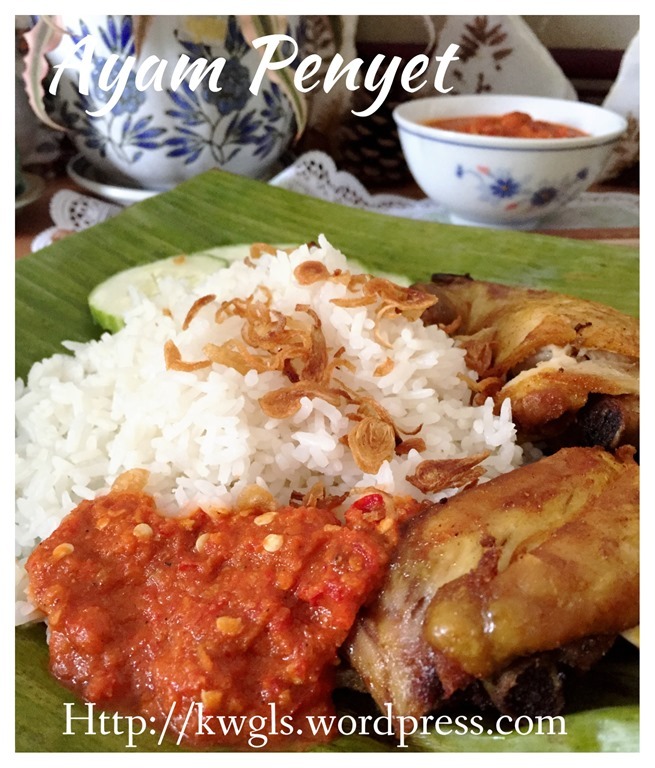 ayam penyet. Bookmark the permalink. 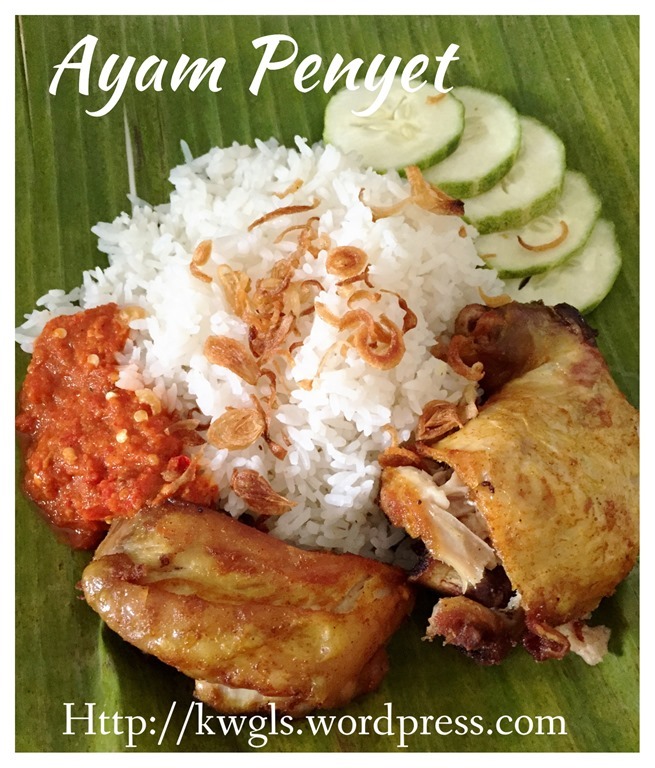 Hi Kenneth, thanks very much for sharing this recipe….my family love this. 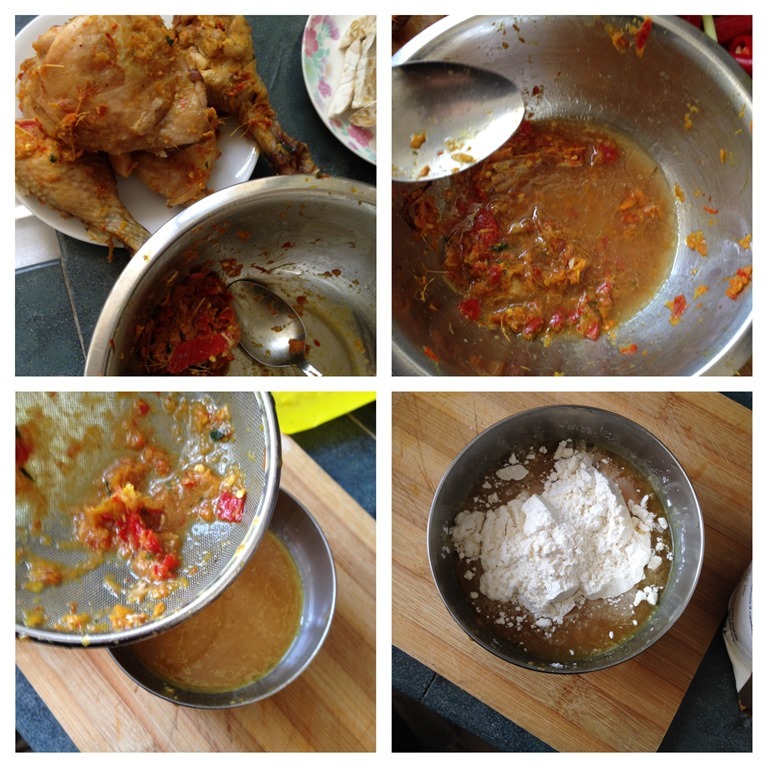 Kenneth, we all love this recipe..the taste very good. 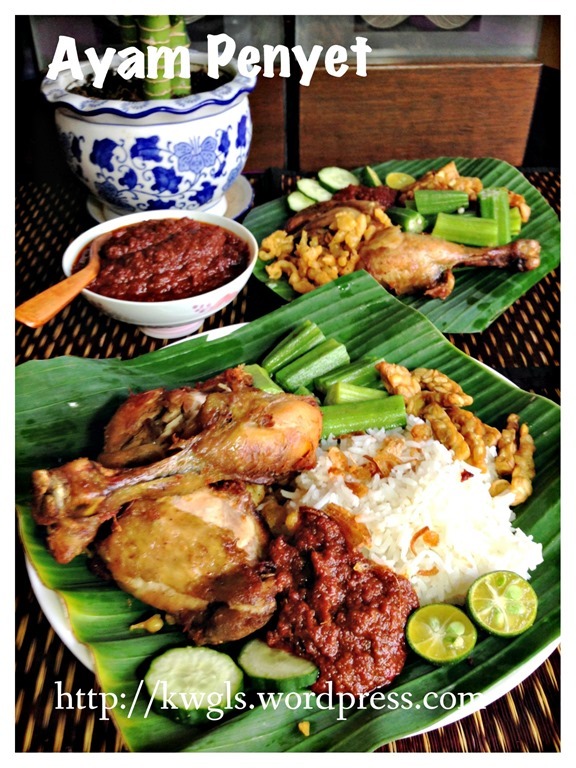 Thanks for sharing as I saw this Indon Fried Chicken in TV, said that was the best in Indon cuisine. 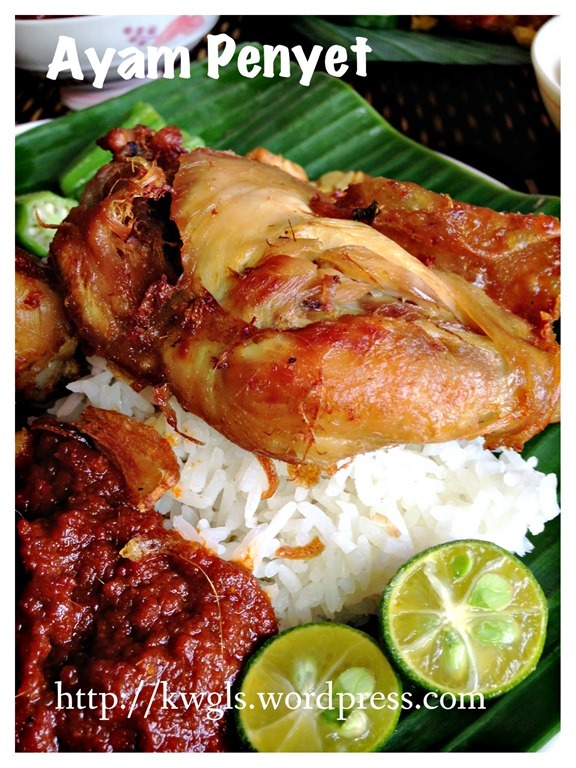 The sambal has tomato in it and fried, it should be yummy, Will try this recipe.